The Lyngby Vase by Lyngby Porcelain and the LE KLINT lamp are among the classics of Danish design history. Both designs emerged from functionalism in the 1940s and, with their cutting-edge lines and white signature colour, there is a symbolic and physical kinship between the two. Lyngby Porcelæn and LE KLINT teamed up for a short time in the 1950s to produce a table lamp that combined the popular grooves of the Lyngby Vase with the Klint family’s proud craftsmanship. Back then, the design was produced as a limited edition, so not many exist today. 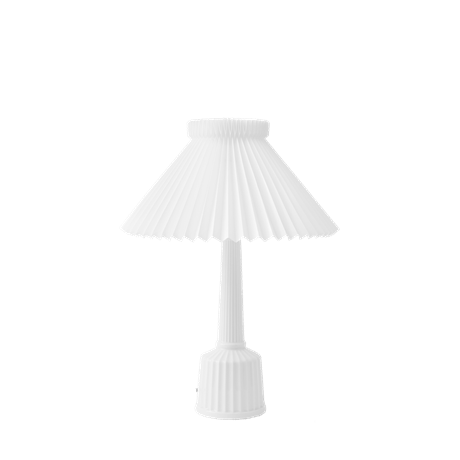 With a bit of luck, you might find some of the original lamps at flea markets – they all had “Eksklusivt produceret” (“Exclusively produced”) printed on the bottom. Lyngby Porcelæn is relaunching the beautiful table lamp that emerged from this unique partnership. 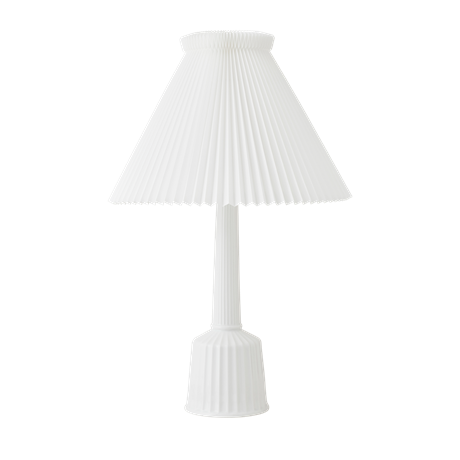 True to the original design of Esben Klint and with an original LE KLINT lampshade. Just like in the 1960s. Read about the designers behind the products.